マントル遷移層から下部マントル条件におけるマントル物質または地殻物質中の主要鉱物であるSiO2スティショバイト、アルミナススティショバイト、Mg3Al2Si3O12パイロープガーネット、Fe3Al2Si3O12アルマンディンガーネット、Ca3Al2Si3O12グロシュラーガーネット、Mg4Si4O12−Mg3Al2Si3O12系メージャライトガーネット、(Mg,Fe)2SiO4ウォズリアイト、MgSiO3アキモトアイトなどの主要な高圧鉱物についての弾性波速度の精密測定を、マントル遷移層に相当する高温高圧下で系統的に行った[4,12,15,16]  SPring-8 publication ID = 22189 Y. Zou et al. 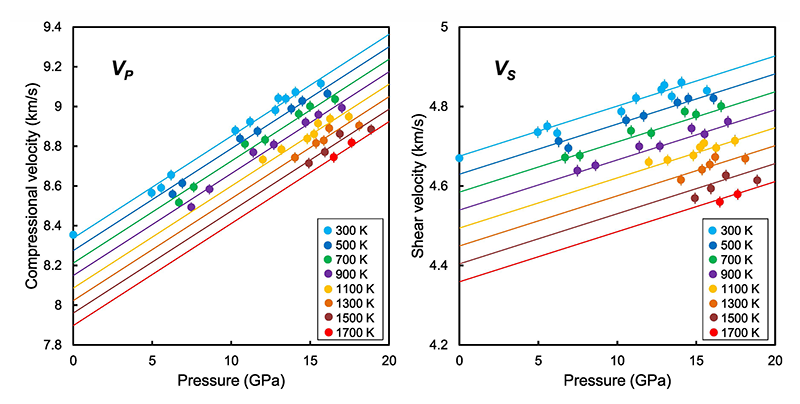 : "Elasticity and Sound Velocities of Polycrystalline Mg3Al2(SiO4)3 Garnet up to 20 GPa and 1700 K" Journal of Applied Physics 112 (2012) 014910. SPring-8 publication ID = 28031 C. Zhou et al. : "Sound Velocities Measurement on MgSiO3 Akimotoite at High Pressures and High Temperatures with Simultaneous in situ X-ray Diffraction and Ultrasonic Study" Physics of the Earth and Planetary Interiors 228 (2014) 97-105. SPring-8 publication ID = 29531 T. Arimoto et al. : "Sound Velocities of Fe3Al2Si2O12 Almandine up to 19 GPa and 1700 K" Physics of the Earth and Planetary Interiors 246 (2015) 1-8. 下部マントルの構成鉱物であるSiO2スティショバイトとCaSiO3ペロブスカイトの圧力(P)－体積(V)－温度(T) の関係を得るため、焼結ダイヤモンドアンビルを用いた実験により最高62 GPaまでの圧力下、最高1900 Kの温度条件下でデータを取得した  SPring-8 publication ID = 21788 F. Wang et al. : "P-V-T Equation of State of Stishovite up to Mid-Lower Mantle Conditions" Journal of Geophysical Research 117 (2012) B06209.。得られたデータに基づき、これらの鉱物のP−V−T状態方程式を定式化した。これにより、下部マントル主要鉱物全てに関して、下部マントル中部条件までの状態方程式が精密に決定されたことになる。これに基づき、マントル物質及び海洋・大陸地殻物質のマントル遷移層から下部マントル条件下での密度を高精度に見積もることが可能になり、沈み込む地殻物質の下部マントルでの動的挙動に強い実験的制約が与えられた。また、下部マントル条件下で新しい含水高圧相（“Phase H”と命名）を発見した（図3）[8,10,13]  SPring-8 publication ID = 26142 M. Nishi et al. : "Stability of Hydrous Silicate at High Pressures and Water Transport to the Deep Lower Mantle" Nature Geoscience 7 (2014) 224-227. SPring-8 publication ID = 28021 M. Nishi: "Deep Water Cycle: Mantle Hydration" Nature Geoscience 8 (2015) 9-10. T. Kawazoe et al. : "In situ Stress-Strain Measurements in a Deformation-DIA Apparatus at P-T Conditions of the Upper Part of the Mantle Transition Zone" American Mineralogist 96 (2011) 1665-1672. F. Wang et al. : "P-V-T Equation of State of Stishovite up to Mid-Lower Mantle Conditions" Journal of Geophysical Research 117 (2012) B06209. Y. Zou et al. : "Thermal Equation of State of Mg3Al2Si3O12 Pyrope Garnet up to 19 GPa and 1,700 K" Physics and Chemistry of Minerals 39 (2012) 589-598. Y. Zou et al. 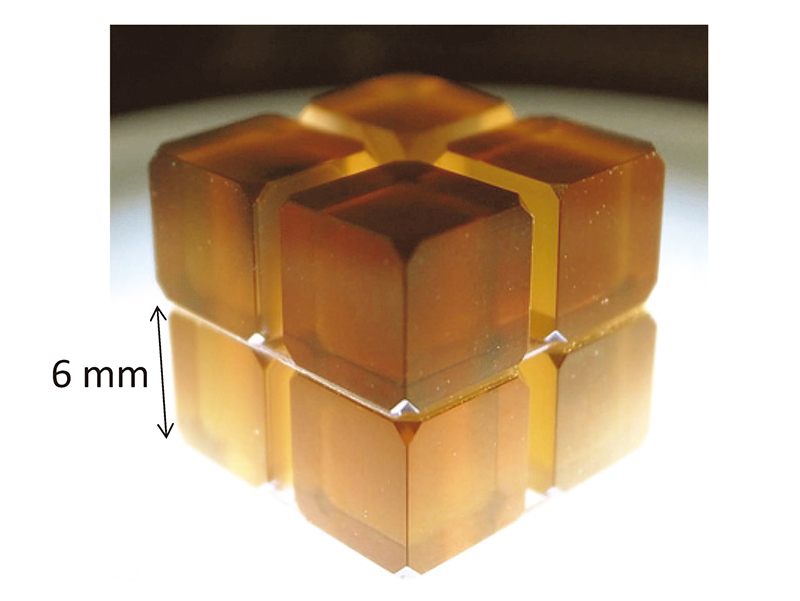 : "Elasticity and Sound Velocities of Polycrystalline Mg3Al2(SiO4)3 Garnet up to 20 GPa and 1700 K" Journal of Applied Physics 112 (2012) 014910. Y. Kono et al. : "Sound Velocities of MORB and Absence of a Basaltic Layer in the Mantle Transition Region" Geophysical Research Letters 39 (2012) L24306. K. Nishida et al. : "Sound Velocity Measurements in Liquid Fe-S at High Pressure: Implications for Earth's and Lunar Cores" Earth and Planetary Science Letters 362 (2013) 182-186. T. Ohuchi et al. : "Development of A-type Olivine Fabric in Water-Rich Deep upper Mantle" Earth and Planetary Science Letters 362 (2013) 20-30. M. Nishi et al. 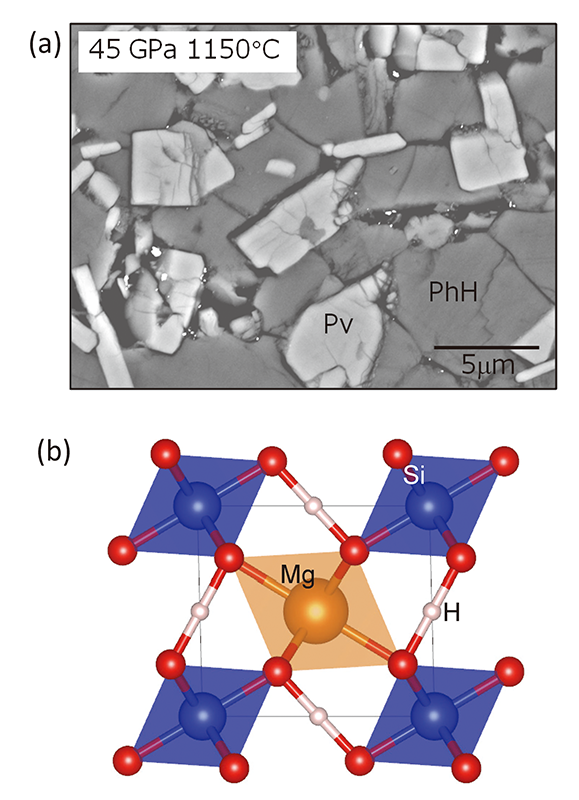 : "Stability of Hydrous Silicate at High Pressures and Water Transport to the Deep Lower Mantle" Nature Geoscience 7 (2014) 224-227. T. Ohuchi et al. : "Crystallographic Preferred Orientation of Olivine in the Earth's Deep Upper Mantle" Physics of the Earth and Planetary Interiors 228 (2014) 220-231. M. Nishi: "Deep Water Cycle: Mantle Hydration" Nature Geoscience 8 (2015) 9-10. T. Ohuchi et al. 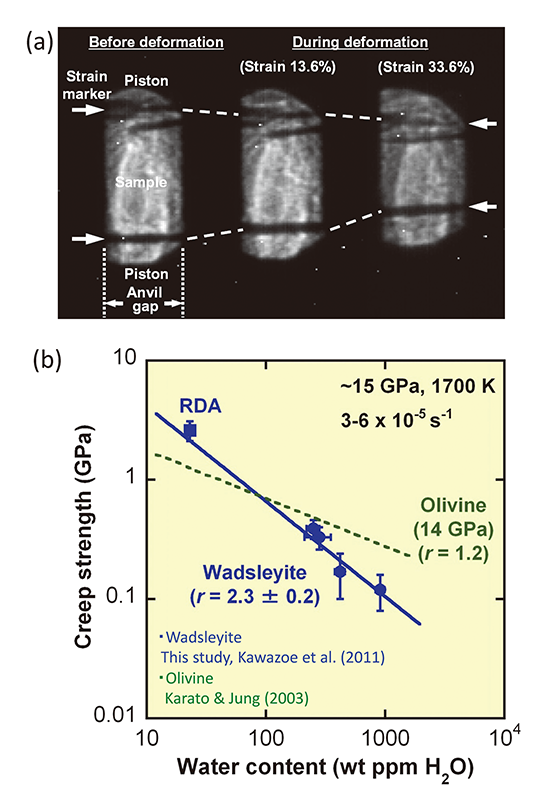 : "Crystallographic Preferred Orientation of Wadsleyite and Ringwoodite: Effects of Phase Transformation and Water on Seismic Anisotropy in the Mantle Transition Zone" Earth and Planetary Science Letters 397 (2014) 133-144. C. Zhou et al. : "Sound Velocities Measurement on MgSiO3 Akimotoite at High Pressures and High Temperatures with Simultaneous in situ X-ray Diffraction and Ultrasonic Study" Physics of the Earth and Planetary Interiors 228 (2014) 97-105. M. Nishi et al. : "Phase Transitions of Serpentine in the Lower Mantle" Physics of the Earth and Planetary Interiors 245 (2015) 52-58. T. Ohuchi et al. : "In Situ Observation of Crystallographic Preferred Orientation of Deforming Olivine at High Pressure and High Temperature" Physics of the Earth and Planetary Interiors 243 (2015) 1-21. T. Arimoto et al. : "Sound Velocities of Fe3Al2Si2O12 Almandine up to 19 GPa and 1700 K" Physics of the Earth and Planetary Interiors 246 (2015) 1-8. Z. Liu et al. : "Elastic Wave Velocity of Polycrystalline Mj80Py20 Garnet to 21 GPa and 2,000 K" Physics and Chemistry of Minerals 42 (2015) 213-222.